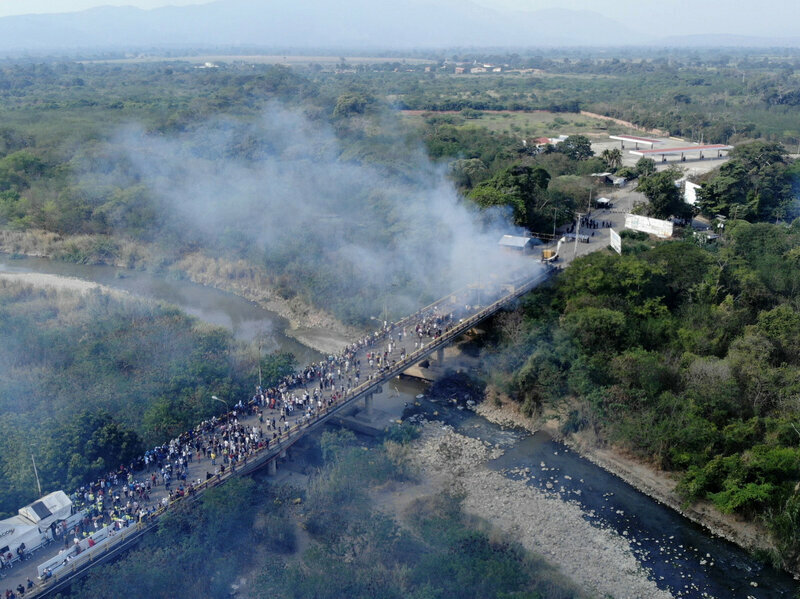 In the morning of Feb. 23, many Venezuelans were hopeful that opposition leader Juan Guaidó would lead a convoy of humanitarian aid into Venezuela from Colombia. Venezuela’s military was ordered to block the convoy from entering, so citizens surrounded military barracks to plead with soldiers to join the opposition. They hoped the 20-year socialist regime would be forced into submission by the sheer weight of popular will. But as the day wore on, one of the aid trucks that tried to make it past the Venezuelan military was set afire. In Caracas, where tens of thousands had surrounded a military airfield, the pleas with the military became more desperate. “We are your children!” “You are hungry, too!” “Choose the right side of history.” The soldiers took pictures and gave the crowds the middle finger. In Africa, I have seen popular movements rise, take shape and build to inflection points, where the course of a country’s history could be easily swayed. That Saturday felt like that kind of moment in Venezuela. Guaidó had incredible momentum. He had a broad international coalition recognizing him as the country’s rightful president. He had hundreds of thousands of supporters on the streets and a plan to bring in humanitarian aid that also served as a perfect counterpoint to the failures of President Maduro. The question was could the opposition execute? Could they take this historic opportunity and really injure the Maduro government? Kenya was months into a standoff between Odinga and President Uhuru Kenyatta. The country had held two elections. The first was thrown out by the country’s Supreme Court, the second was boycotted by Odinga. Some opposition strongholds were so beset by violence the second time that polls never opened. At least 100 opposition supporters were reported killed by police and pro-government groups, with some estimates even higher. By the time Odinga announced his intent to “inaugurate” himself as president, the government had had enough. It felt a lot like Venezuela: two men claiming the presidency in a high-stakes jostle for power. Kenya’s government had promised a violent crackdown and that it would charge Odinga with treason, which is punishable by death, if he went through with his plans. Just as Venezuela’s security agents have come out in force, the streets of Nairobi were militarized in advance of the opposition event in the park. Paramilitary police, armored vehicles and water cannons were stationed at nearly every corner. The security forces retreated. They didn’t fire tear gas, they didn’t shoot or beat anyone as they had in the past. And at that moment, it became clear that Odinga had won over the majority of Kenyans. Similarly, in Venezuela, the opposition mobilized a sea of people to the streets of Caracas saying “somos mayoría” — we are the majority. Odinga’s running mate and other opposition members did not show up to the ceremony, where they risked being arrested or seeing a bloodbath. It was Aug. 1, 2018. The opposition had just competed in Zimbabwe’s freest elections since the country ended minority white rule and became Zimbabwe in 1980. It was also the first election without Robert Mugabe on ballot. So, it was without a doubt the chance of a lifetime to oust the ZANU-PF party that had ruled Zimbabwe for almost four decades. But as the votes came in, observers noted vast irregularities and it became clear that Emmerson Mnangagwa, once Mugabe’s deputy and now the head of ZANU-PF, would soon be declared the winner. The rebelliousness that many had expressed openly — even in Mugabe’s home town — turned into bitter resignation. One thing I’ve learned on the continent is to be ready for surprises. Ethiopia is one country that recently had a stunning outcome, which may even hold lessons for Venezuela. In a way, like Ethiopia’s opposition did, Venezuela’s opposition leader offered a major concession — an amnesty for armed service members who turn against Maduro. Ultimately, few security agents have defected to Guaidó’s side. And, while some protesters did face off with the Venezuelan military, Guaidó made a decision not to use his people power to push further — to make the military decide whether they will shoot unarmed civilians to keep Maduro in power. This is Maria, one of the few protesters on the highway. Her daughter was killed by a thief and she says she is tired of the insecurity in Venezuela. This must end, she says. Guaidó says this fight is not over. But that’s the same thing Odinga said in Kenya and opposition leader Nelson Chamisa said in Zimbabwe. And for a few weeks after those pivotal moments, things simmered and hope lingered. It feels that way in Venezuela, where a huge protest is planned for the weekend. But following those two key days in Kenya and in Zimbabwe, it slowly became clear that their governments weren’t going anywhere and that a generational opportunity for change had dissipated.